In January 1998 I ordered an Astro-Physics 900 GTO from Company Seven. After eagerly awaiting its coming for nine months, the mount has finally arrived. It truly is an artistic as well as engineering work of art. The AP900 is very well built, extremely sturdy, and a joy to use. This section of my web page includes a narrative on setup and operation of the mount, and my personal thoughts and critiques of the AP900 as I put it into operation. The AP900 GTO is a computer controlled mount featuring a GOTO keypad controller and DigitalSky Voice software. The mount offers a rapid slew rate of five degrees per second (1200x). The keypad allows for control of all basic mount functions (such as slewing and tracking, PEM control, backlash control, easy two star polar alignment, as well as control of remote focus). Advanced keypad features allow you to automatically slew to several thousand deep sky objects. This makes digital setting circles unnecessary. The DigitalSky Voice software adds additional flexibility to the system by adding two way voice control of the mount. 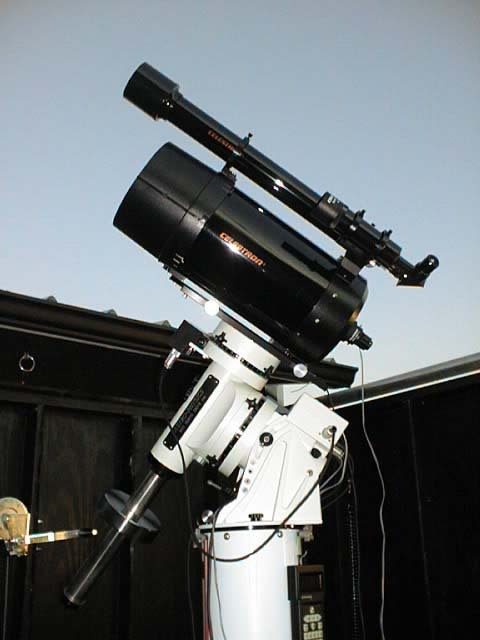 In conjunction with a personal computer, the telescope can be pointed by simply saying "Saturn nebula" or "Find Stephen's Quintet". The computer also offers voice output to guide you through polar alignment, and gives extensive object data. My 900 arrived packed in two large boxes, surrounded my several million packing peanuts. I'm still picking them up here and there. The 900 consist of three basic pieces, all easily manageable. The polar axis (RA) assembly and declination (DEC) assembly make up two of these pieces. A unique dovetail feature allows easy mating of these two items, which are locked in place with two knobs; no tools are required for field setup. The counterweight shaft (third piece) can then be threaded into the DEC assembly. I ordered the mount, dovetail plate (DOVE15) and a pair of Parallax Instruments mounting rings for my Fastar 8. The rings did not fit the OTA, so I sent them back (shame on Parallax) and went with a regular sliding bar (SB15SC) attachment to the bottom of the scope. I did not order a tripod, as I am mounting the unit permanently in my observatory. I may order one at a later date for star parties. The mount does come furnished with a pier adapter plate, used to attach the mount to any post or pier drilled for AP mountings. The LeSeur Astropier nicely fits the bill. The pier adapter plate fit perfectly into the top of my Astropier, and is secured with over six screws. The mount itself is held in place above the adapter plate with four threaded knobs. The keypad is the heart of the mount system. The keypad allows the user to automatically slew to objects in a wide range of databases. Any non-database object can also be located with RA/DEC coordinates. The databases include over 300 stars (for use primarily in keypad-aided north polar alignment, two star polar alignment, or GOTO drift alignment), 90 celestial objects by common name, Aitken's double star (ADS) list, about 10,000 NGC, IC, and all Messier and solar system objects. Several tours can also be defined, based on visible objects (above the horizon), or Constellation, etc. All of the mount electronics are housed in the control box. It includes the RA and DEC servo motor connections, several COM links to a PC (for use with Astro-Physics DigitalSky Voice and other party software simultaneously), focus motor control and illuminated reticle power, autoguider connection, and several auxiliary power receptacles (12 volt for Kendrick dew remover products, etc.). Power to the mount is 12 volts at three amps. Power can be supplied by a 12 volt car battery or AC/DC converter (not included with the mount). To use the mount, it must first be set up and calibrated. The latitude and longitude of the observing site, date, and local time, must be entered one time. Up to three observing sites can be defined. The mount must then be calibrated on a known star. The mount uses this information to calculate where it is pointed at all times. Once calibrated, the mount cannot be moved by hand, but can be using the N-S-E-W buttons of the keypad. Otherwise, calibration is lost and the unit must be recalibrated on a known star. It is possible to calibrate one time, and then "park" the mount at the end of an observing session. This will maintain the RA and DEC settings indefinitely. Calibration can be performed during polar aligning. There are three polar alignment routines to choose from, all of which calibrate the mount. For example, to north polar calibrate the mount you pick a star that is at least four hours different in RA than Polaris and sight on this star (say, Vega). The scope is manually aimed at Vega, and centered with the N-S-E-W buttons in the keypad. Then, you calibrate on Vega by picking it from a list of preprogrammed stars, and the mount will then slew back to Polaris. You then center Polaris using the altitude and azimuth adjusters. This process can be repeated many iterations, with accuracy increasing after each try. Two-star calibration (used when Polaris is not visible, or in southern latitudes) and a GOTO drift alignment are also possible. The latter gives the mount fantastic tracking accuracy. It is similar to the drift align method, but is much quicker. Orthogonality of the scope is critical to proper alignment. A scope is not orthogonal if the optics see at an angle that is not exactly 90 degrees to the declination axis. The mount itself is designed to be very orthogonal. But, some telescopes are not. The AP900 also includes a routine used to test your scopes orthogonality. 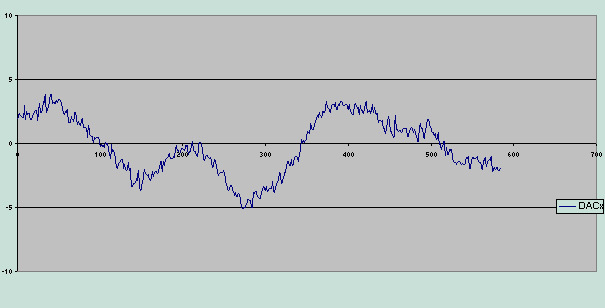 Based on the results of this test, you can shim up tube rings or mounting plates to adjust this offset. The mount basically shows you how much correction to make! The declination and RA backlash can also be adjusted on the AP900, as well as corrections of the PEM (permanent error memory). A PEM circuit can be trained to memorize small errors in the RA drive worm. It takes about eight minutes to set the correction (which constitutes one revolution of the RA worm) during which time one keeps a guide star centered on crosshairs. Errors in the drive are corrected with the keypad, and these corrections are permanently memorized. During critical guide applications, the PEM is played back, and these corrections applied to the tracking. This laborious task can be simplified by hooking an autoguider (say, an ST-4) to the mount and allowing it to automatically make PEM corrections during training. This is an extremely accurate way to correct the PEM, and affords unguided 15 to 30 minute exposures. I spent the first two clear nights properly setting up and aligning the mount. Once roughly polar aligned, I tried out the goto capabilities of the mount. Even when not accurately aligned, the mount placed celestial objects in the field of my 40mm Plossl. After a bit of play, I performed an orthogonality test. This suggested I needed to raise the back of the optical tube ever so slightly. I added two very thin metal washers to the rear of the sliding bar, and this brought the scope to a higher level of alignment. This done, I set about performing a drift alignment on the scope. To do this, you need to pick four stars. Two of them need to straddle the celestial equator on either side of the meridian. By slewing back and forth between the two of them, and making adjustments in altitude, you can close in on the pole. This is also done with two stars in the east (or west) that fall along the same right ascension, but differ in declination. The hardest part about this is figuring out which stars to use. After finishing all of the alignment routines, I was satisfied I had a very accurate polar alignment. Now, the scope places objects dead center in the eyepiece as well as the chip of my CCD camera. I finally had a clear night, and got a chance to train the PEM circuit using my PixCel 237's autoguide feature. This done, I set about producing some images on 16. November 1998. The results can be found at the Imagebydate page. The seeing was a bit poor due to smoke in the atmosphere, but I was able to complete a ten minute unguided exposure using the AP900 and PEM feature. I am confident I could have gone longer. These images were produced at f/1.95. I will perform similar tracking tests at f/10 to see how well the mount tracks. http://www.astro-physics.com. Get on the waiting list today!